Adds a less-than-lethal fatigue-dealing Stun Gun to the game. 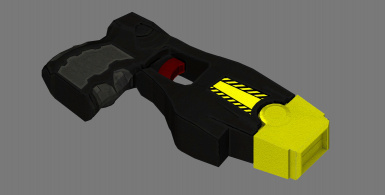 The Taser X26 mesh was made by Mirza Miftahul Fadillah and is licensed under CC Attribution. I found it for free on Sketchfab (http://sketchfab.com/models/a196e086c4b240b087197a07d0f93e9c). I converted the model to NIF format and made it work in game. I also edited the textures to remove the brand name markings and made the normal maps to give the weapon some texture. 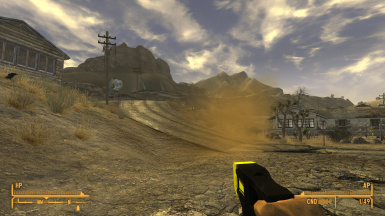 This mod is a New Vegas port of my similar mod for Fallout 3, and adds a less-than-lethal fatigue-dealing Stun Gun to the game. 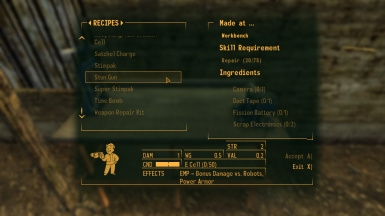 The stun gun deals no damage to living targets while simultaneously dealing 500 fatigue damage - enough to knock out a low-level raider for about 20 seconds. 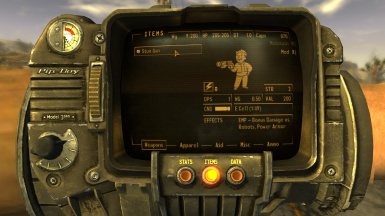 Being an electrical weapon, it will deal bonus damage to robots and disable power armor users. 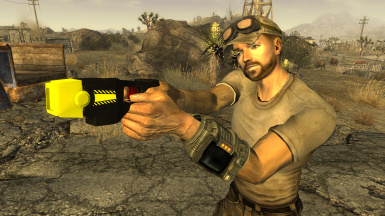 The stun gun uses a craftable custom ammo type and can be repaired with either itself, a Zap Glove or Cattle Prod.